The full interview can be watched, and the Washington Times article can be read at the hyperlinks provided above. There is a Unity Party, I thought this was talking about them…. the headline might need to be revised. The Unity Party is a recognized Party in CO.
Paging Mayor Bloomberg. Paging Mayor Bloomberg. Don’t know whether they’ll end up running or not. Though in the meantime, Kasich’s talk about the possible rise of a multi-party system has provided some opportunity to encourage people to join minor parties. I’ve been able to use this news a bit to help spread word of the Prohibition Party. I dunno, if Trump gets seriously dinged, if the Ds appear to be likely nominate a Sanders-type, despite the obstacles, I could imagine a centrist ticket could be viable. Remember, if Donald Trump can be elected, anything’s possible. Here is a sad reality. There are people in the Libertarian Party who are so unprincipled that they would vote for these clowns to be the LP’s presidential ticket in 2020. We’d hear about how qualified and experienced they are, and how nominating them will make the LP look more serious to the media. We’d hear about how this ticket would unite the left and right. Anyone in the LP who dissents from this tiicket would be labeled as an extremist who wants the party to remain a small tent. We all know that this is true. 2 years old… but still relevant! Category should be non-left-right parties. “Third parties general” means articles which apply to all non-D/R parties regardless of ideology – for example, a change of ballot access laws that impacts all parties, a court ruling about general debate inclusion rules, an initiative to create or shut down a top two system. Non-left right parties is the category for parties which don’t fall into the ideological party categories (left/socialist, free market/liberty or right wing minor parties) or the second tier three (L, G, C). Did you mean ” (left/socialist, free market/liberty or right wing minor parties) or the second tier three (L, G, C).” or ” (left/socialist, free market/liberty, or right wing minor parties), or the second tier three (L, G, C).”? If the 20 choices are Trump, Warren, Kasich, or Kokesh, I’ll definitely stay home. I’d likely root for Kasich of the possible winners as somewhat less hurtful of the plausible choices. Voting for Kokesh, or not voting, and not rooting for anyone, would be the only principled stands, in my opinion. I would vote for Kokesh under the above scenario. I know that he’s not going to win, just like most LP candidates, but at least voting for Kokesh would be a legitimate protest vote, and I think that he would do a better job of educating the public about libertarianism of any candidate that the LP has had on its presidential ticket in a long time (I don’t think that the LP has even had anyone on its ticket that I’d even call a libertarian since 2004). When I rooted for HRC, all that meant was I saw less downside from her administration than I did with DJT’s. I rooted for Romney, Obama, Bush (barely) and Bush, but I didn’t SUPPORT them. I thought they’d be a little less bad on a prospective basis. It’s a little game I play in my mind. Don’t over-interpret. The winners turned out to be damaging, and I can’t say whether we’d be less bad off if McCain, Kerry, or Gore had won. We can’t know, since they lost in this universe and we’d have to have two universes to compare. I would not vote for Kokesh because I don’t wish to support unqualified extremists with even 15 minutes of my time. I’d probably agree with him more than Trump, Warren, or Kasich, but I don’t wish to offer the symbolic gesture of my time for a candidate who hurts the cause of liberty by confirming the worst stereotypes about Ls. I thought that you were rooting for Johnson/Weld in 2016. How are Libertarians supposed to get any experience if self professed libertarians don’t support them? Also, isn’t it experienced politicians who created all of the messes that we have right now? If Cynthia McKinney does join the Libertarian Party, would you support her if she ran for the LP’s presidential nomination, being that she’s a former 6 time elected Democratic Party Congresswoman, and a former Green Party candidate for President? Cynthia McKinney has “shiny badge” experience, so I’m just wondering if the LP’s “Shiny Badge” Caucus would get behind her if she ran for office as an LP candidate. aj: I thought that you were rooting for Johnson/Weld in 2016.
me: No, it was clear to me they would not win. I supported them enthusiastically, although I did not agree with them on every single issue. Had GJ not reversed himself on the burqa ban, I probably would NOT have supported him. I rooted for Perot in 92 because he had an outside chance. Other than that, I root for a R or D as the winner is most likely to be R or D. See the difference now? aj: How are Libertarians supposed to get any experience if self professed libertarians don’t support them? me: A single vote is almost certainly inconsequential. My vote only counts TO ME. aj: Also, isn’t it experienced politicians who created all of the messes that we have right now? me: Agreed. Our politics is degenerating, and the condo association is WAY too intrusive, from my perspective. Whom I root for is the one who I assess to be likely to make a bit less of a mess. aj: If Cynthia McKinney does join the Libertarian Party, would you support her if she ran for the LP’s presidential nomination, being that she’s a former 6 time elected Democratic Party Congresswoman, and a former Green Party candidate for President? me: I might, although I have vague recollections of some odd skeletons in her closet. I’d surely take a long look, and I’d want get some assurance that she’s actually reasonably lessarchistic. I would LOVE to vote for a lessarchist African-American woman. Great optics! I can’t speak for the non-existent SB Caucus. So Bob Barr, Wayne Root, Gary Johnson, Bill Weld, etc.., did not have any skeletons in their closets?!?!?!?!?!? Everyone does, including them. Theirs were processed. McKinney’s have not been. IF she makes noises, I’ll take a closer look. Robert, I would say more accurately that their’s were ignored by a majority of convention delegates. The “shiny badge caucus” exists to the same extent as “NAPsters”. I can’t comment on the delegates’s state(s) of mind, since I wasn’t there and — even if I had been — I cannot read minds. I would be surprised if a roomful of Ls didn’t find SOME fault with those candidates. IIRC, you are a non-NAPster L and you have repeated my sense that the NAP is more properly considered a sentiment as opposed to an operative principle. If you have better nomenclature for NAP sentimentalists and NAP literalists, I would greatly appreciate a more helpful short-hand. Chances are, if a Kasich-Hickenlooper happens, they’d probably seek the LP nomination. It’s more cost effective to seek the LP nomination than to get on the ballot as an independent. 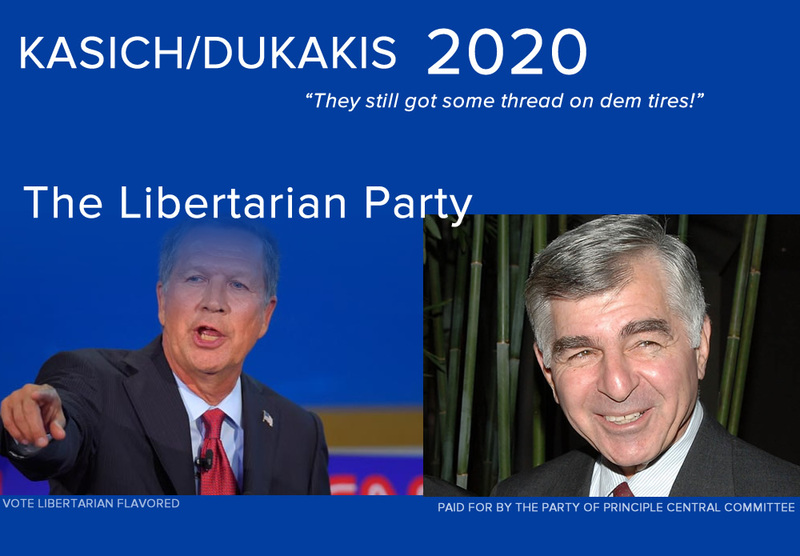 Plus, given the unliberatarian track records of Bob Barr, Johnson, and Weld, it only makes sense the LP would nominate Kasich-Hickenlooper over principle. Yes, it’s more cost effective, but Barr had been on the LNC and GJ had long been solicited by Ls to leave the Rs, given his views. Nothing like that can be said of Kasich or Hickenlooper. 2016 LP VP candidate, Bill Weld, endorsed John Kasich for President in February of 2016, about 3 months prior to Weld showing up in the LP. Since Bill Weld endorsed Kasich, that must mean that Kasich is a libertarian, or a libertarian leaner, right? I’d say No. It means that Weld thought he was the best candidate in the R field from his perspective, and I find that fairly coherent, although I thought RP2 was. Weld didn’t just show up. GJ asked him to join him on the ticket. He and many cosmotarian Ls had a very similar reaction to DJT: that he was a slow motion train wreck, with tremendous downside for the nation. The Never Trump movement seemed pronouncedly justified, given his temperament and mercurial treatment of important issues. Many paleo, alt-right NAPsters, OTOH, took a shine to Trump. Mostly this is probably a function of subtle and not-so-subtle hatred of immigrants. The fact that Gary Johnson wanted to run with a CFR gun grabbing, warmongering, police state loving, Bush/Clinton/Romey loving, establishment shill like Bill Weld, illustrates what a fraud Gary Johnson is. Keep in mind that I was a Gary Johnson skeptic from day one, so once again. I was ahead of the curve, and I waa proven to have been correct. The problem with the Never Trump crowd waa that they opposed Trump for the wrong reasons. The Never Trumpers were not remotely libertarian. The enemy of your enemy is not necessarily your friend. I do not agree with those among the libertarian and/or constitutionalist crowd who got behind Trump, but I am willing to forgive some of them, just as I am willing to forgive some of those who got behind or voted for Johnson. Hopefully the Libertarian Party will come up with a better choice in the next election. aj: Never Trump crowd waa that they opposed Trump for the wrong reasons. me: Partially agreed. The neocons didn’t like Trump’s musings on America First foreign policy yelps. Heck, I recall Bill Kristol saying he might vote for GJ because if he did he wouldn’t feel the need to take a shower afterward. And it’s that sense of Trump as a Archie Bunker-meets-PT Barnum that I think caused cosmotarians to nod to the NEVER TRUMPers, some of whom were not properly neocons. For ex., Boaz contributed to the NEVER TRUMP issue of NR. Trump’s race-baiting bigotry and calls to violence were and are very disturbing to we cosmotarians. The revelations that Trump was an avid reader of Hitler’s speeches made a Trump presidency something to avoid with all urgency. I oppose the NAP pledge as a membership oath because it makes the LP into a cult which can only honestly be joined by anarchists (if they know what the NAP actually means and wouldn’t sign it if their political views would violate it). As an anarchist myself, I can honestly sign the NAP. However, I am an anarchist for utilitarian reasons, not natural rights reasons. Both are paths to anarcho-capitalism. I prefer anarcho-capitalism because liberty leads to the best outcomes. If you have better nomenclature for shiny badge sentimentalists and shiny badge literalists, I would greatly appreciate a more helpful short-hand. Sure, shiny badge sentimentalists could be MBAs. An MBA is very useful in one’s career, but one need not have one to excel in business. Or Qualificationists. Shiny badge literalists could be MDs. You MUST have an MD to practice medicine. Or Prerequisitists. Are there actually any Prerequisitists in the LP? I’d think most shiny badgers would be Qualificationists, as in, it’s strongly recommended that high-profile candidates have won elective office.